I'm still working on this page to fill it with all the different kinds of systems. Soil Diagnostics. High Paramagnetic Volcanic Rock Dust. Round Tower electromagnetic earth and cosmic fertilizer. The objectif of the magnetoculture installation is to increase health and welbeing of the field and so of all crops growing on the filed to give better yields with higher vitality and nutritional value. Those Magnetic Beewax Antenna Capacitors are new system developed in 2009 from the synthesis of my personal experiments from the last ten years and the study of the discoveries and practices of Don Jose Carmen, Justin Christofleau, Philip Callahan, Marcel Violet and Georges Lakhovsky. In 2009 I made the first magnetic beeswax antennas and installed them in a field with cabbages. The farmer had the problem of having always little cabbages of only 2 to three kilos each, after the installation, the cabbages begun to grow rapidly and healthy. They had almost 2 to 4 weeks advance on their time. When the yield was done, we measured cabbages of 6 to 9 kilos ! This without any chemical fertiliser or pesticide. How to Use the Beewax Magnetic Antennas? The capacitors are put into holes of 30 to 100 cm (76 to 254 inches deep) all around the treated field. The holes are digged at specific places all around the field, dependend on the water veins, the energy lines, the Ley lines and solar and maximus energetic lines. There are approximately 16 to 41 capacitors for 2,5 Acres, this depends on the magnetic energy concentration you would like to have the best results. Or 32 to 82 capacitors for 10 Acres. You best ask advice for a proposal to us. You need minimum 5 capacitors whatever the size of the garden, one in each corner and one in the middle is the minimum to make the energy field circuit. I advice one at each 10 to 12 meters or 30 to 40 feet all around the garden and one in the middle. 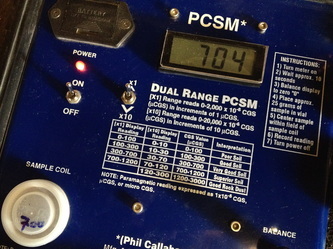 The capacitors putted around the field are put in place vertically with the antenna pointing to the south. They are put in harmony with the local earth magnetic field to increase the power of it locally for the benefit of the wellbeing of all live on the field. 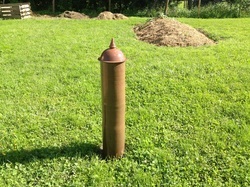 There is one that is also putted at the center of the field with the antenna pointing to the sky, this is to connect the energies and radiation of the universe to the field. It makes like a connection. To detect the specefic places of your field, we come to do the installation. We make also a report and a map or cartography of your field with some of the important energetic lines usefull for this application and with the indication where the capacitors are placed. The capacitors generates a permanent magnetic field because of the huge magnet inside. What is more amasing is that these capacitors also generate a permanent electric field, this is probably because of the electret phenomenon. These capacitors are real free energy generators. They generate permanent electric and magnetic energy. 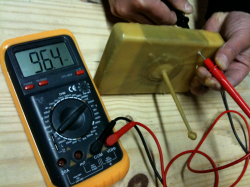 Photo : Electric Voltage measured on the beewax Capacitors. What is an Electret ? opposite. Plant leaves are weak electrets because they are coated with wax. The charges, as in a magnet, are permanent. 2. Round Tower electromagnetic fertility enhancer. & High Paramagnetic Rock dust to increase soil fertility. 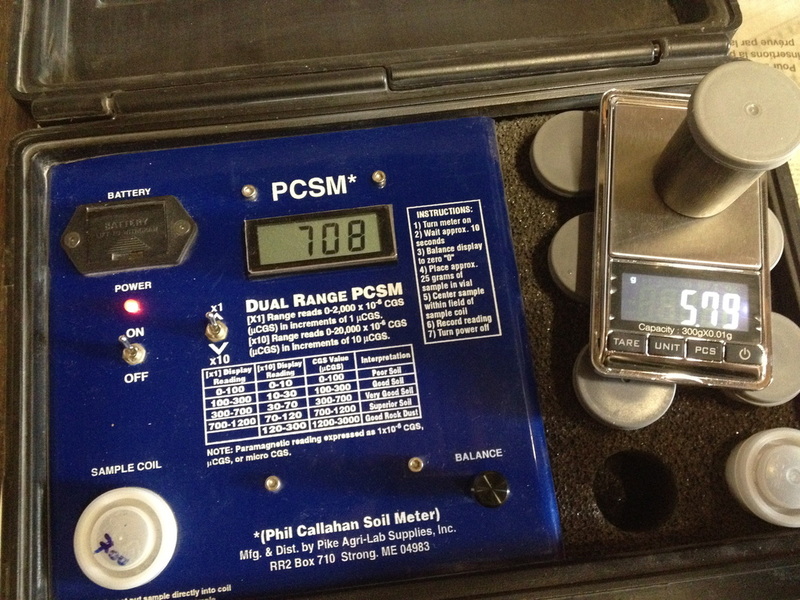 & PCSM measurement device to make diagnostics of paramagnetism of your soil. From the discoveries and work of Phil Callahan it is known that high paramagnetic values of your soil coincide with high fertility of the soil. We can advice you which fertilisers to use and techniques to increase this in your soil. We propose the service to make diagnostics of your soil or fertilisers you use, about the electro physical values and paramagnetic values of it. Photo : Tower made as home for a bee Hive. The same tower in paramagnetic rock concrete can be tuned and made to put in the field and increase a lot the growth and development of the crops. You can read more about this in the Book "The Magnetic Life of Agriculture" from Philip Callahan. Such towers can also be made to enhance the fertility of the fields. One tower made of paramagnetic rock of 6 foot high and 1 foot diameter can fertilize up to 100 acres. The tower has to be well constructed and placed on certain energy spot where positive energetic lines crosses. The action radius would spread all over the north side of the tower in a clover like shape, this is taken into account when we decide for the spot where to place it in the field. 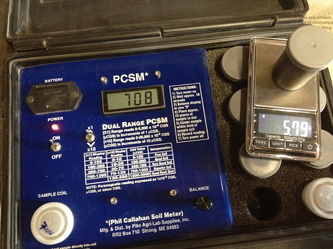 For this we use a PCSM (Phil Callahan Soil Meter) and bioelectronic meters to test oxidation, acidity, conductivity, resistivity and redox of your soil. This gives you a good idea of the health of your soil. You just have to send us the samples, 100 grammes of each sample, so we can make you the diagnostic and make you a report. 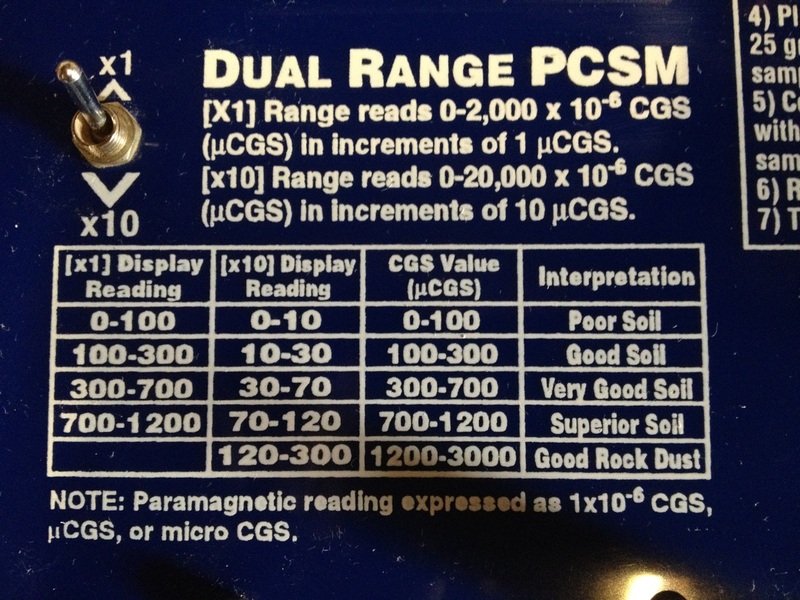 To increase the paramagnetic values we can advice your the best techniques and fertilisers to use. We are not selling fertilisers, we just advice you what are the best methods in our eyes to increase the wellbeing and fertility of your soil. The paramagnetic aspect is very important, this gives the sensibility of your soil to the earths magnetic field. the earths magnetic field works like a resonator that communicates a lot of information in electromagnetic waveforms important for the health of the plants and the soil. The more the soil is paramagnetic, the more the soil is like an antenna capable to communicate and amplify these magnetic fields and electromagnetic information. 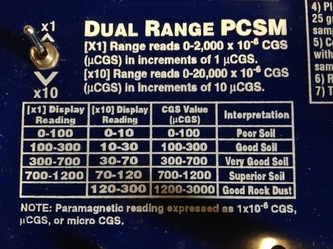 Paramagnetic Values in CGS units to measure the paramagnetic fertility value or potential of the soil. 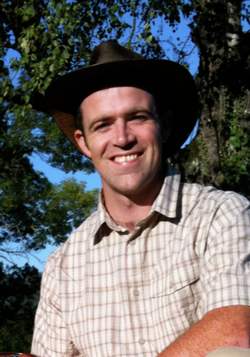 You can contact me with your soil samples, so i can propose you to make the diagnostic. For this just send me the soil samples, and i write you back with the result of the paramgnetic measurements. For the price, contact me to ask. A Pyramid can be a very usefull tool in the garden. It can help to heal plants, increase growth rate, increase the vitality of seeds or increase their storage. You can build a pyramid of any size. Here some guidelines to build a pyramid. Use copper wire, rods or tubes for the edges. For bigger pyramid size you can make the edges also in wood but then put a copper wire on the wood to follow the edge. The Height is 1,618 times the length of the Basis or Side. 1,618 is the golden mean that you use to calculate the right proportion of Height, Side and Edges. The Edge is close to the Basis divide by 1,051. Below you find the book of Les Brown, where it is described how to build a pyramid and how to work with in the garden. The Lakhovsky coil is interesting to treat individual plants. It can help to increase their energy and help them heal or grow better in stressed conditions. The opening has to be to the north, the wire of copper, the diameter is adviced to be around 30 cm. The coil is put in an angle and the ends doesn't touch each other, it is an open coil. The wire doesn't have to touch the plant. You can hold or fix the wire with a little wooden stem.